For all the arrangements and all hotel services we can provide you gift cards. The gift cards, for example, for spa weekends can be bough for one specific date or for a given season. Gift cards do not lose their value after the expiration date. You can use them foor booking and paying partial costs. Like every year at Christmas, birthday, or wedding anniversary you wonder what you can give your loved ones? What should you, for example, give your parents, who already have everything? A good idea would be one of our spa offers, a short trip in our prestigious Baltic Sea hotel. Traditional spa times are always the times outside the major holiday periods, that is, the period from January to April and the period from October to Christmas. The typical spa vacation is scheduled for regeneration and recovery. The beach hotel Villa del Mar offers hotel vouchers, spa vouchers, hotel- and spa vouchers and restaurasnt vouchers.Order your favorite voucher with us, pay for them in advance and present this voucher to your loved ones. The recipient will then call us for a travel date and enjoy his gift. 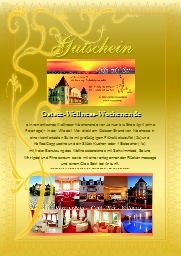 you will finde examples for our gift cards in our wellness-voucher-shop. The gift card is valid for one person between 29. January and 27. April.